If you look at your house, you’ll find that you have a lot of junk that you don’t use anymore. As we grow up, we need to detach ourselves from things sometimes. The best way to get something out of this would be to sell them on eBay. You get rid of all the junk you have at home, and at the same time, you make money out of it. Below are tips on how one can go about making money as a college student on Ebay. Sell the old stuff you have. There are so many things you can sell. Examples are clothes, electronics (these are good ones), and books. The items mentioned are people want to get great deals on. We all know that college is EXPENSIVE. If we can save money, we’re going to do it, right? To get an idea of how much your item will sell, look up other auctions that are similar to yours. Let’s say that you’re trying to sell your PS1, look up the same items and follow them. When the auction ends, you get to see how much they sold for. This gives you a general idea on how much they usually send. Take note of how the seller took a picture of their item, what kind of description they have, and all these little details. Schedule to have your items end on a weekend or during weeknights. Schedule to end your auction where your buyers are online. Don’t schedule the auction to end at 3 am in the morning, but schedule it to end in the afternoon. The weekends are better because that is when they are online. Because of the selfie generation, by now you should probably know how to take awesome pictures. Use printing paper if you want to go all white or you can put it on a clean desk. Try not to put it on the floor as it tells the buyer that you don’t take care of your stuff. Use the eBay app on your phone to make it easier to list. Using the eBay app expedites things a bit. You won’t need to transfer your photos to the computer. All you need is to take a picture there and upload. It’s faster than you think. Establish good feedback to be trustable. To establish good feedback, try to buy a few things off of eBay first. When you buy something, pay for it right away. If you are skeptical, trying buying something cheap, such as Stickers or pens or something. These will only cost a few dollars. Once you are comfortable, you can buy more stuff. As long as you pay quickly, you’ll get positive feedback. This is a tactic I always use. Whenever I want to sell a device, I look up the prices of the people selling the same thing. If you watch long enough, you would be able to tell how much your device would probably sell. Do yourself a favor and use 0.99 cents on your auction. This will attract a lot of viewers which you want. Don’t worry. Your device will never sell 0.99 cents. I assure you that there are plenty of people who would want to buy it at 0.99 cents, but because there are so many people wanting that same price, they will bid for it and fall into the bidding addiction. Describe your item using PLENTY of details. When you are writing your description, make sure that you mention any scratches, the time period you had it, if you took care of it, and why you are selling it. As long as you’re honest, you will get good feedback. NEVER SUGAR-COAT your postings! Once you sell it, you will receive a complaint from you the buyer and it will just be a big headache. Sell to people who have high feedback. There is a setting where you can change the people who are able to bid. Make sure that the people have at least 5 feedback and are 100 percent positive. 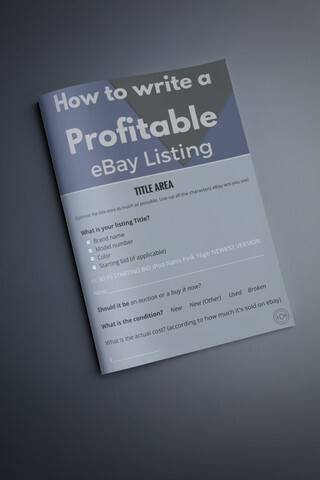 Since this might be your first time, you want to deal with people who have been doing business on eBay. They will treat you the way they want to be treated. Trust them and they’ll trust you. Wait until the buyer has paid for an item. Once they have, that is when you should ship your product. Make sure that your shipping policy is aligned with what you put on the product description. If you say that you are going to ship it within 2 business days (M-F), do that. It’s a good idea to buy a tracking number for now and alert your buyer that you have shipped the product. Be friendly and ask them how they are doing once they have received the item. Always offer support as they will like this. You don’t need to text or email them. You can strictly send them messages on your eBay account. Earn your reputation first! The higher the transactions you have, the more people will trust you! Only sell to people who have a reputation, if you have any problems, you can always contact eBay to help you. If you do all these things, I promise that you will become an expert in selling stuff on ebay. Who knows? Maybe you’ll start doing this for your friends. Maybe you can earn a little bit of commission from them. What do you think?